, an eminent ecclesiastical historian of the last century, was the son of a father of the same names, descended of a noble family in Normandy, by Mary Vitart, of a family in Champagne. He was born at Paris, June 17, 1657, and after being instructed in the rudiments of grammar by his father, and private tutors, was entered, at the age of ten, of the college of Harcourt, where, under professor Lair, he imbibed that thirst for general knowledge which he indulged during the whole of his studious life. In 1672 he was admitted to the degree of master of arts. Having made choice of the church as a profession, he went through the usual course of studies at the Soi bonne, and employed much of his time in perusing the fathers and ecclesiastical historians, but had no other view in this than to gratify his curiosity, while preparing himself for his licentiateship in divinity, which he was then too young to obtain. In 1680, he took the degree of bachelor of divinity, and in July 16S4, that of doctor. He soon after undertook to publish the work which has made him most known, his Universal Library of Ecclesiastical Writers, containing their lives, and a catalogue, critical account, and analysis of their works: a design of vast extent, which might have done credit to the labours of a society, yet was successfully accomplished by an individual, who was not only interrupted by professional duties, but wrote and published a great many other works. The first volume of his “Bibliotheque” was printed at Paris, 1686, 8vo, and the others in succession as far as live volumes, which contained an account of the first eight centuries. The freedom, however, which he had used in criticising the style, character, and doctrines of some of the ecclesiastical writers, roused the prejudices of the celebrated Bossuet, who exhibited a complaint against Dupin to Harlay, archbishop of Paris. The archbishop accordingly, in 1693, published a decree against the work, yet with more deliberation than might have been expected. His grace first ordered the work to be read by four doctors of divinity of the faculty of Paris, who perused it separately, and then combining their remarks, drew up a report which they presented to the archbishop, who, in his decree, says that he also examined the work, and found that it would be very prejudicial to the church, if it were suffered to be dispersed. 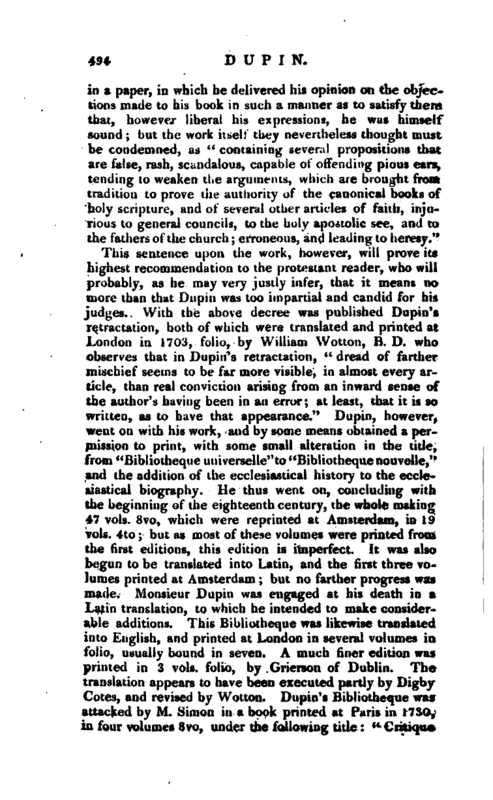 Dupin was then summoned before the archbishop andthe doctors, and after several meetings, gave | in a paper, in which he delivered his opinion on the objections made to his hook in such a manner as to satisfy them that, however liberal his expressions, he was himself sound; but the work itself they nevertheless thought must be condemned, as “containing several propositions that are false, rash, scandalous, capable of offending pious ears, tending to weaken the arguments, xvhich are brought from tradition to prove the authority of the canonical books of holy scripture, and of several other articles of faith, injurious to general councils, to the holy apostolic see, and to the fathers of the church; erroneous, and leading to heresy.” This sentence upon the work, however, will prove its highest recommendation to the protestant reader, who will probably, as he may very justly infer, that it means no more than that Dupin was too impartial and candid for his judges. With the above decree was published Dupin’s retractation, both of which were translated and printed at London in 1703, folio, by William Wotton, B. D. who observes that in Dupin’s retractation, “dread of farther mischief seems to be far more visible, in almost every article, than real conviction arising from an inward sense of the author’s having been in an error; at least, that it is so written, as to have that appearance.” Dupin, however, went on with his work, and by some means obtained a permission to print, with some small alteration in the title, from “Bibliotheque universelle” to “Bibliotheque nouvelle,” and the addition of the ecclesiastical history to the ecclesiastical biography. He thus went on, concluding with the beginning of the eighteenth century, the whole making 47 vols. 8vo, which were reprinted at Amsterdam, in 19 vols. 4to; but as most of these volumes were printed from the first editions, this edition is imperfect. It was also begun to be translated into Lathy, and the first three volumes printed at Amsterdam; but no farther progress was made. Monsieur Dupin was engaged at his death in a Latin translation, to which he intended to make considerable additions. This Bibliotheque was likewise translated into English, and printed at London in several volumes in folio, usually bound in seven. A much finer edition was printed in 3 vols. folio, by Grierson of Dublin. The translation appears to have been executed partly by Digby Cotes, and revised by Wotton. 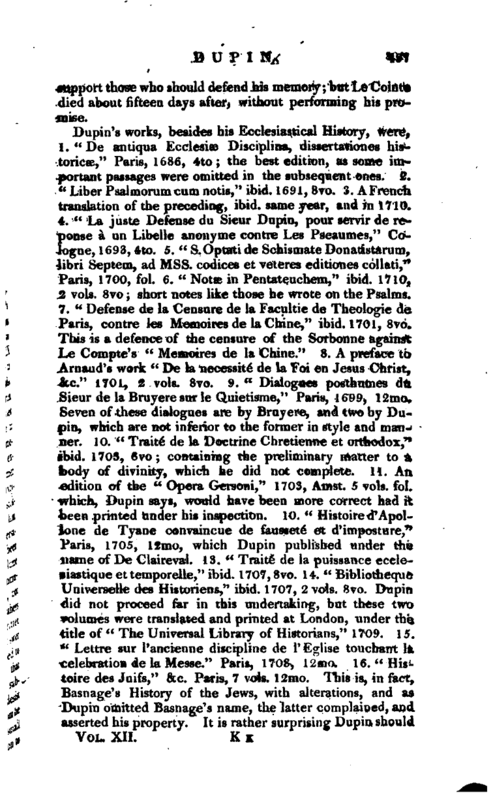 Dupin’s Bibliotheque was attacked by M.Simon in a book printed at Paris in 1730, in four volumes 8vo, under the following title “Critique | cle la Bibliotheque des Auteurs Ecclesiastiques & de Prolegomenes de la Bible publiez par M. Elies Dupin. Avec des eclaircissemens & des supplemens aux endroits, ou on les a juge necessaires, par feu M. Richard Simon, avec des remarques.” Simon has pointed out a considerable number of errors in Dupin, but when all deductions of this kind are made, it must be allowed that we have no book more generally valuable as a repository of ecclesiastical history and biography, making allowance for the author’s attachment to the principles of his church. 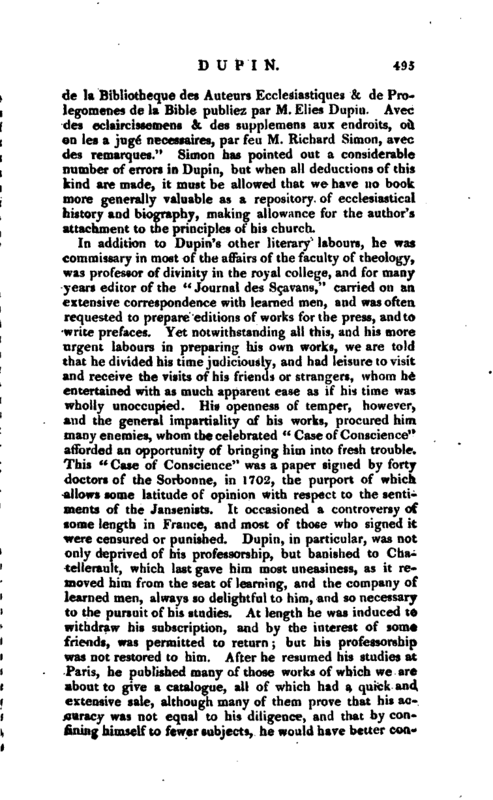 In addition to Dupin’s other literary labours, he was commissary in most of the affairs of the faculty of theology, was professor of divinity in the royal college, and for many years editor of the “Journal des Scavans,” carried on an extensive correspondence with learned men, and was often requested to prepare editions of works for the press, and to write prefaces. Yet notwithstanding all this, and his more urgent labours in preparing his own works, we are told that he divided his time judiciously, and had leisure to visit and receive the visits of his friends or strangers, whom he entertained with as much apparent ease as if his time was wholly unoccupied. His openness of temper, however, and the general impartiality of his works, procured him many enemies, whom the celebrated “Case of Conscience” afforded an opportunity of bringing him into fresh trouble. This “Case of Conscience” was a paper signed by forty doctors of the Sorbonne, in 1702, the purport of which allows some latitude of opinion with respect to the sentiments of the Jansenists. It occasioned a controversy of some length in France, and most of those who signed it were censured or punished. Dupin, in particular, was not only deprived of his professorship, but banished to Chatellerault, which last gave him most uneasiness, as it removed him from the seat of learning, and the company of learned men, always so delightful to him, and so necessary to the pursuit of his studies. At length he was induced to withdraw his subscription, and by the interest of some friends, was permitted to return; but his professorship was not restored to him. 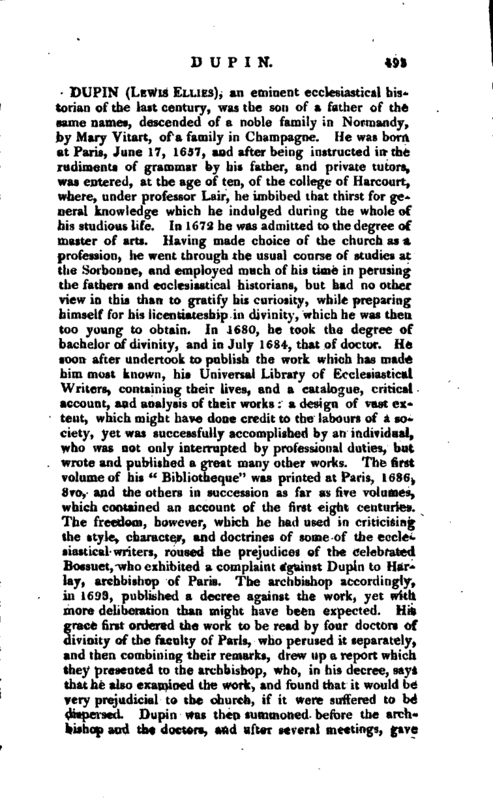 After he resumed his studies at Paris, he published many of those works of which we are about to give a catalogue, all of which had a. quick and extensive sale, although many of them prove that his accuracy was not equal to his diligence, and that by confining himself to fewer subjects, he would have better | consuited his reputation. It must, however, be acknowledged that he possessed considerable taste, great freedom from common prejudices, a clear and methodical head, and most extensive reading. He corresponded with eminent men of different communions, and was much censured and threatened for a correspondence he carried on with archbishop Wake, respecting the union of the churches of Rome and England. Dupin and some other doctors of the Sorbonne were the first movers of this plan, although Mosheim, in his first edition, has represented Dr. Wake as offering the first proposals. This matter, however, is placed in a more clear light in the last edition of Mosheim, edited by Dr. Coote (1811) in the Appendix to which (No. IV.) 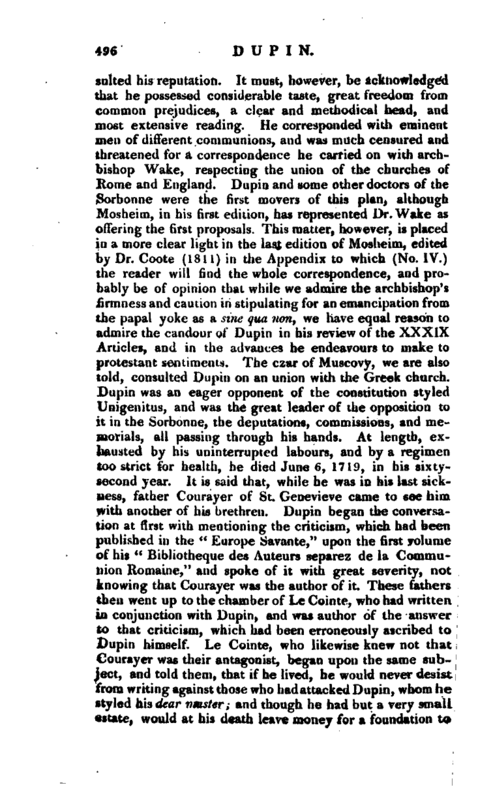 the reader will find the whole correspondence, and probably be of opinion that while we admire the archbishop’s firmness and caution in stipulating for an emancipation from the papal yoke as a sine qua non, we have equal reason to admire the candour of Dupin in his review of the XXXIX Articles, and in the advances he endeavours to make to protestant sentiments. The czar of Muscovy, we are also told, consulted Dupin on an union with the Greek church. Dupin was an eager opponent of the constitution styled Unigenitus, and was the great leader of the opposition to it in the Sorbonne, the deputations, commissions, and memorials, all passing through his hands. At length, exhausted by his uninterrupted labours, and by a regimen too strict for health, he died June 6, 1719, in his sixtysecond year. It is said that, while he was in his last sickness, father Courayer of St. Genevieve came to see him with another of his brethren. 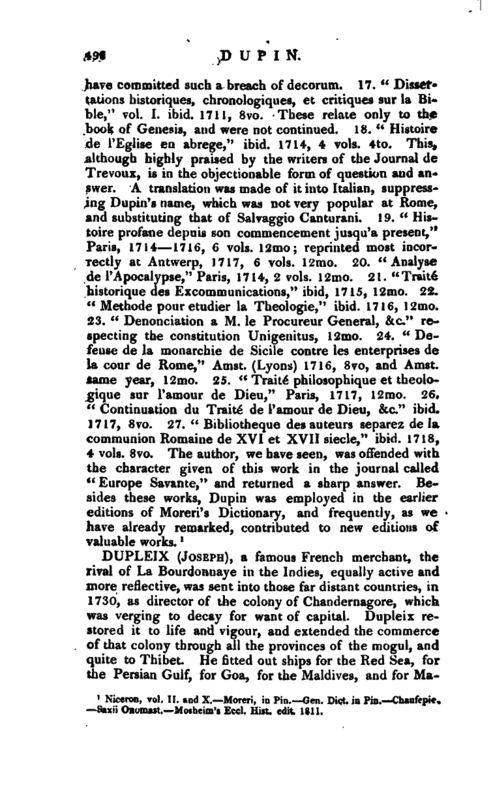 Dupin began the conversation at first with mentioning the criticism, which had been published in the “Europe Savante,” upon the first volume of his “Bibliotheque des Auteurs separez de la Communion Romaine,” and spoke of it with great severity, not knowing that Courayer was the author of it. These fathers then went up to the chamber of Le Cointe, who had written in conjunction with Dupin, and was author of the answer to that criticism, which had been erroneously ascribed to Dupin himself. Le Cointe, who likewise knew not that Courayer was their antagonist, began upon the same subject, and told them, that if he lived, he would never desist from writing against those who had attacked Dupin, whom he styled his dear master; and though he had but a very small estate, would at his death leave money for a foundation to | support those who should defend his memory; but Le Cointe died about fifteen days after, without performing his promise. Niceron, vol. II. and X.—Moreri, in Pin.—Gen. Dict. in Pin.—Chaufepie. —Saxii Onomast.—Mosheim’s Eccl. Hist. edit. 1811.